Former Indiana forward Jeremy Hollowell will finish his collegiate career at Georgia State. The news was first reported by Jon Rothstein of CBS Sports and a source close to Hollowell confirmed the report to Inside the Hall. 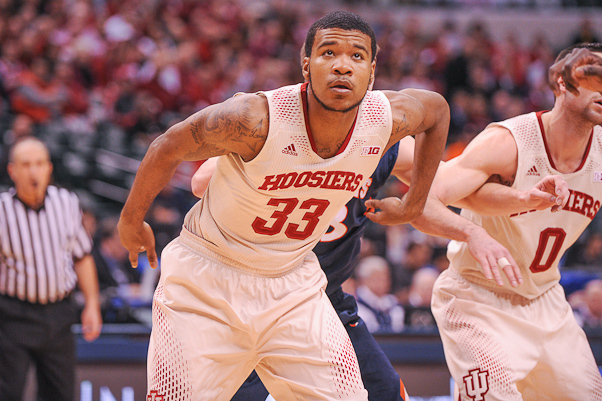 Hollowell averaged 5.7 points and 3.5 rebounds for the Hoosiers last season. The Lawrence Central product originally came to Indiana in the 2012 class with Hanner Mosquera-Perea, Peter Jurkin and Yogi Ferrell. The 6-foot-8 Hollowell will have to sit out the 2014-2015 season and will become eligible for the 2015-2016 campaign for coach Ron Hunter, who was at IUPUI before taking over at Georgia State in 2011. As a sophomore at IU, Hollowell started 15 games this season and scored a career-high 18 points in IU’s 77-46 win over Evansville on Nov. 26. Hunter will get the best out of JH after sitting out a year…. I would say that’s a much better fit than Bloomington.. Best of luck JH, wish things could’ve worked out. I hope so, for his sake. Atlanta can be a pretty distracting place, though. Yep, if partying was an issue with my kid in B-town I sure wouldnt send him to Atlanta. He has the talent. He has huge potential (which means he’s not good enough right now). But he has to work hard to earn it. Hopefully he comes back with big return for Hunter’s trust in him. I guess I’m under the assumption that it was lack of drive, and not lack of focus that handicapped JH in Bloomington. Maybe a place like Georgia State will allow him to step up and build some confidence. Yes, ATL does have an array of distractions.. but Bloomington has it’s own set of very different distractions..
Ron Hunter brings back memories. Watched him play along side the great Ron Harper at Miami of Ohio. I guess the rest of college basketball thought he was a bust as well. I really thought Jeremy would be a difference maker for IU. Maybe he will do better being a big fish in a small pond. A really small pond that is. Guessing JH had a really good relationship with Hunter from their time in Indy together. Kid has to show he can play..G_State might be his best place to do that. Good luck to him. JH will be “older, wiser”, and I suspect more appreciative of his talents and use them better. I expect that Hunter will get his best. Good for JH and good for Georgia State. JH has a lot of talent. Hopefully he does well at Georgia State. Will be interesting to see who else Hunter is able to lure down there. A real shame – if you’re in the top 50 of your high school class, you should be considered a prime contender for a spot in the NBA by the end of your college career. You may not be a one and done or two and done, but you’re close enough to the top that you have a realistic chance of making that next level if you can just put in the work and continue your development as a player. I really hope Hollowell will take this opportunity and turn things around – he really has potential to be something great. He’s reeling in the transfers. He had Ryan Harrow from Kentucky this year and next year he’s got Hollowell and Kevin Ware from Louisville. Lol Johnson and /or Buss commit next ! I wasn’t sure where he would end up, but the fact it’s Georgia State tells me a lot. I was always behind Jeremy. Wish it would have worked out better. U can say what you want about Tom Crean..but he has a lot of respect among his peers. When a kid is suspended by a program like IU, run by a Coach like Crean…red flags have to go up. Talent-wise, IMO Hollowell is now at a b-ball level where he can excel. I am with you on, “putting the work in and continuing his development as a player”.. I just don’t think he’ll ever be a ‘great’ player. At one time, I really hoped and felt he could be difference maker at IU. But I do think he was given every opportunity, to do that… He just didn’t seem to have the drive. I’m sure a lot of coaches watched film on him and probably walked away with the same conclusion. At times he almost seemed to lack interest. I do wish him well, and feel he is in a much better place for him. I am glad he’s leaving. I felt he just didn’t contribute much to the team. I wish him luck and success at Georgia State. I am thinking that year removed from actually playing in the game will do him some good and rekindle a fire for him. I’m not sure I’m convinced he has a ton of respect from his peers. Hollowell was set to visit Iowa State as well. I think this has more to do with him being comfortable with Ron Hunter and RJ. you may be on to something…..
Just curious, what does him transferring to Georgia State tell you in your opinion? Well, I thought a top program would be interested. And apparently there weren’t. And that may tell us if the other top programs didn’t want him, neither did we. What do you think? it should also be mentioned that ron hunter is their coach. former IUPUI coach, and his son and JH are childhood friends. whoops, looks like it has been mentioned half a dozen times already. i’m a moron. No man you made your point you’re good. Like you said, if Clemson was knocking on his door he would be a Tiger. I’m on the same page as you. I’m somewhat surprised though that he didn’t end up at a top program, he has the ability to be very good. I think the change of scenery, coupled with less pressure/scrutiny to reach his full potential, will allow JH to finally find some individual success during his tenure at Georgia State. I wish him all the best. When a kid is suspended by a program like Indiana and a coach with Crean’s general rep among his peers..red flags have to go up.